Comment | The Arms Trade Treaty: Will it have any worthwhile impact? This December, the Arms Trade Treaty (ATT), the first of its kind aimed at regulating the international arms trade, will become part of international law. Without political will, however, none of its desirable impacts are likely to happen, warns Nicholas Gilby. The Arms Trade Treaty (ATT) will become part of international law on 24th December. On 24th September Argentina, the Bahamas, Bosnia and Herzegovina, the Czech Republic, Portugal, Saint Lucia, Senegal, and Uruguay ratified the Treaty, taking the number of ratifying states above the 50 required for it to enter into force. What will its impact be? How will these impacts be achieved? How will we know if the Treaty has had an impact? Unfortunately, even the committed proponents of the Arms Trade Treaty cannot give convincing answers to these questions. What will the impact of the Arms Trade Treaty be? “The situation in South Sudan is just one example of why there is an urgent need for the ATT. In the world’s newest country, thousands of lives have already been lost this year and nearly 2 million people have fled their homes – yet more and more weapons flood into the country each day, fuelling the violence”. According to the SIPRI Arms Transfers Database, since South Sudan became independent in 2011, 97 per cent of its arms have come from Russia. Russia abstained at the UN General Assembly vote on the Arms Trade Treaty in 2013, and has not signed, let alone ratified, the Treaty. Indeed, according to this article, Russia is “indifferent” to it. So, although the article suggests otherwise, the only possible conclusion from a cold examination of the facts is that the Treaty will make no difference to South Sudan’s “urgent need”. Ultimately, only time will tell if this is correct. However, a look at the available evidence suggests this is more likely to be wrong than right, and thus merely wishful thinking. The idea presented, in the context of a discussion of Russia, is that the Arms Trade Treaty “will create a strong deterrent for all countries – even those not a party to it – to end uncontrolled arms transfers”. The problem is that almost all Russian arms transfers are undoubtedly “controlled” at the moment, in the sense that they take place with the full approval of the Russian Government, which presumably has no qualms about their scale. Indeed the Russians have a state intermediary agency – Rosoboronexport – that oversees the vast majority of Russia’s arms exports and imports. And, obviously, there is nothing that could “deter” the Russians from ending their arms exports, for the simple reason there is nothing in international law that can deter a non-signatory to a UN Treaty. Further, it seems naïve to think Putin could be bullied in this way. Indeed, even the former Foreign Secretary, William Hague, told Parliament that the Arms Trade Treaty would not change Russian willingness to supply Assad’s Syria. The problem with the Arms Trade Treaty is that quite simply it does enable the UK to claim to be upholding the principles of the treaty and meeting the Treaty criteria, while at the same time pushing arms and ammunition to human rights abusers around the world. That the UK does push arms and ammunition to human rights abusers around the world is not in dispute. And yet, the UK is already claiming to be upholding the principles of the treaty and meeting the Treaty criteria. It has told Parliament that “no primary legislation is required for UK ratification”, “the treaty is consistent with our national systems for control of transfers of conventional arms and will be implemented through existing procedures” and “Government policy is unchanged”. The only change the Government has made (see paragraph 40) is a minor technical change to the UK’s brokering controls to ensure all categories of weapons covered by the Treaty are now included. And there is absolutely nothing to suggest the UK will change in any way the current level of promotion of arms exports, for example trade delegations to India and the United Arab Emirates, the designation of priority markets for UK arms sales, the existence of the Defence and Security Organisation within UKTI, where 130 civil servants are employed full-time promoting arms sales, or the holding of regular arms fairs in the UK in East London and at Farnborough. The reason is quite simply because nothing in the Arms Trade Treaty text prohibits any of these activities. In other words, none of the desirable impacts of the Arms Trade Treaty identified in the article are actually likely to happen, and there is nothing in the article at all to suggest that there is a causal mechanism in the Treaty which might enable them to come about. How will the impacts of the Arms Trade Treaty be achieved? This is the important question, and to which one searches in vain for an answer. Any impacts will not be coming soon. Looking at SIPRI’s Arms Transfer Database for 2013 (latest data), we find that (looking at supplier data), only 24.2 per cent of the international arms trade is covered by states that have approved or ratified the Treaty, and will thus be bound by it when it enters into force. If we add in states that have signed it (and who, one imagines, will probably ratify it one day – although this could be many years hence), 55.2 per cent of the international arms trade is covered. Of the states who have not done anything yet, and who are arms suppliers, four (Canada, Israel, Jordan and Singapore) voted in favour of the Arms Trade Treaty in the General Assembly. Assuming that they eventually sign and ratify the Treaty, 59 per cent of the international arms trade will be covered. Almost all the other 41 per cent of the international arms trade (39.6%) is covered by two very important suppliers – Russia and China. So the ability of the Arms Trade Treaty to cover enough of the international arms trade to have a chance of having a serious impact on it depends on those two countries. China has apparently told the First Committee of the United Nations that it supports a “balanced” regulation of the arms trade and is “seriously considering signing” the Arms Trade Treaty. However, it is very difficult to believe that any permanent member of the UN Security Council could ever be “deterred” into ratifying or implementing the Treaty. The only option open to the international community is persuasion, not pressure, and I have yet to see a convincing explanation of how Russia, China or the US can be persuaded to ratify and implement the Treaty. Other analyses are more realistic. For example, the head of the peace, reconciliation and security team at Coventry University’s Centre for Trust, Peace and Social Relations, Paul Holtom, accepts that “it will take several years before we can really see an impact”. They contend the Treaty can have a positive impact as long as “it is implemented and interpreted to the highest possible standards”. This, I think, is exactly right. The international arms trade treaty only sets a framework (and a pretty leaky one at that); ultimately what matters is political will. After all, the UK export licensing criteria are far stricter than the provisions of the Arms Trade Treaty, and yet the UK Government boasts that the UK has the second largest share of the international arms market! Indeed the UK Government regularly congratulates itself on securing increases in UK arms sales (as it did in 2014 and 2013). And if the UK thinks no change in behaviour is necessary, why would any other state? Unfortunately, apart from saying that there is hard work yet to come, no one that I have seen can articulate clearly how the Arms Trade Treaty can have an impact, nor how states can be made to implement it in a manner which would lead to a positive change. And without a theory of change that sets out causes and effects convincingly, it is difficult to see how we can identify the correct way to create political pressure to effect the required changes. What do states who have ratified the Arms Trade Treaty have to do? The Arms Trade Treaty sets a number of criteria which states have to assess each potential arms export against before it can be permitted. According to Article 13, for instance, States must produce, after the Treaty’s first year, an “initial” report of the “measures undertaken” to implement the Treaty. Thereafter States do not have to provide any further information about “measures undertaken”. States must also provide an annual report “concerning authorised or actual exports and imports of conventional arms” as defined in Article 2(1). There is no requirement for the reports to be made publicly available. Furthermore, there is no definition of what information should be provided, States are permitted to exclude “commercially sensitive or national security information” at will, and nowhere in the Treaty does the Secretariat have the power to specify what must be in the reports. So, for example, any country could simply say “Last year we exported 400 battle tanks, 800 armoured combat vehicles and no other conventional arms”. To be compliant they would have to provide no further information than that sentence (assuming that sentence was true). They do not have to provide as much information as that provided to the UN Register of Conventional Arms. With such weak reporting provisions, no evaluation of the Arms Trade Treaty can be possible. And because of this, there is no way for any State violating the Treaty to be held to account, because nowhere in the Treaty do they have to provide the necessary information. Public reports of dubious transfers can simply be dismissed by an assertion that the Treaty has been complied with. It is self-evident that the States which are “violating” the Treaty are unlikely to provide adequate information to enable other States to hold them to account. Further, and more worryingly, it means that it is going to be rather difficult to justify any desirable amendments to the Treaty, as there will likely be no adequate evidence at all to base any advocacy on. In the UK we are fortunate to have a very active and engaged Parliamentary Committee, the Committees on Arms Export Controls, which subjects the UK Government’s decisions to a great deal of scrutiny. But nothing like this will be possible with the Arms Trade Treaty. And, further, because other member states, like the Committees on Arms Export Controls, will have no power of sanction over any Government, it is difficult to see how misbehaving states, including the UK, can be made to mend their errant ways. Q. What will the impacts of the Arms Trade Treaty be? A. No one really knows. They will probably be very limited and not the ones claimed by many of the campaigners. Q. 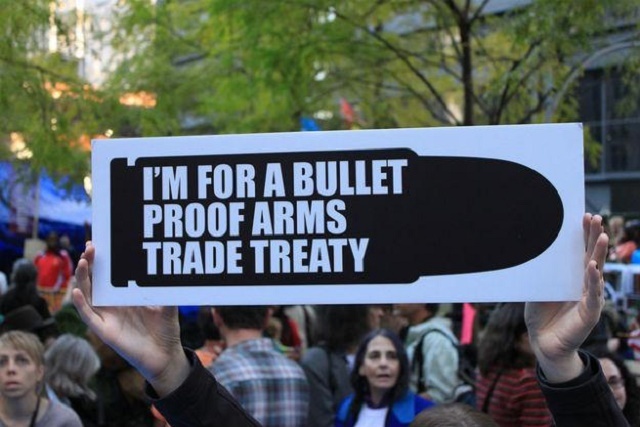 How will the impacts of the Arms Trade Treaty be achieved? A. Significant impacts can only be achieved if Russia and China can be persuaded to sign and ratify. No one seems to know how this could be done. Further, even states that declare themselves to be strong supporters of the Arms Trade Treaty, such as the UK, have no intention of changing their behaviour, and indeed many are trying to increase their arms exports. Q. How will we know if the Arms Trade Treaty has had an impact? A. We do not know what the reports produced under the Arms Trade Treaty will look like. But it is almost certain that insufficient information will be available for anyone to know whether the criteria for permitting exports in the Treaty are being followed. Let me be clear. I am not arguing the Treaty is worthless. If it causes some countries to improve their laws around the arms trade, all well and good. But laws and regulations in any field are only effective to the extent they are taken seriously. The UK is a great example of how a sound legal framework can still permit vigorous participation in the international arms market. Good laws, consistent across states, are only a very first step towards enabling us to contemplate a cure to the problem. Further, I do not fear, as some campaigners do, that the Treaty will somehow “legitimise” the arms trade. The arms trade’s rottenness cannot be glossed over quite so easily. I think a more likely outcome is the international arms trade will continue largely unhindered, as it does now, but that the Treaty will fall into disrepute. A great deal of work has gone into campaigning for a Treaty, and it is a huge achievement to have secured one. But that should not blind anyone to the reality of the problem that we face. I dearly hope my analysis in this article turns out to be totally wrong. If so, I will gladly write a follow-up piece entitled “I was wrong about the Arms Trade Treaty”. But I doubt I will end up doing so. 37 countries are listed as arms suppliers.